I have to admit, I keep very few books. Once I read them, I am off to my next literary adventure. 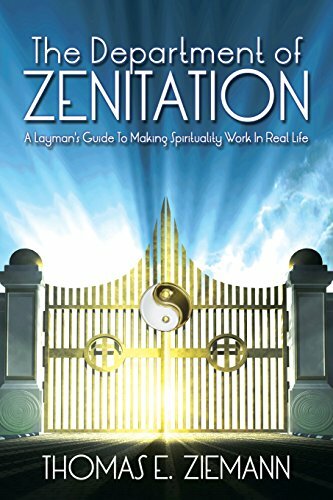 With “The Department of Zenitation,” by Thomas E. Ziemann, I have to hold on to it, because I know that each chapter will hold a different meaning for me depending upon where I am at any given point in my life. In other words, as I evolve, so will the author’s words and the meaningful quotes, written by great minds, at the end of each chapter. I appreciate the years of research and study that gave Ziemann the insight and material with which he could create this wonderful resource for my soul. Initially, I read the book from start to finish, however, I plan to go back to the topics as they occur in my life so that I can read about them, meditate, and hopefully gain insight into what I am experiencing, and what I can learn from it. “The Department of Zenitation,” is the perfect tool for journaling. Perfection, Stagnation, and Relationships were the topics that resonated with me the most. Next month there will be other topics that fit the bill because my life will be in a different place. Most of the quotes are by people with whom I am familiar, like Shakespeare and Maya Angelou. There are some, however, that are new to me and I would like to do more research into learning about them. Authors Unknown however will remain a mystery, but I am grateful for this moment in time to learn about something that they shared that was meaningful enough to be written down. “The Department of Zenitation” by Thomas E. Ziemann would make a perfect gift to yourself, or for others who are not looking for anything to complex or deep to read in which to better their lives. The reader can take Ziemann’s writing as deep as they like, but can also keep it simple if they so choose. Highly recommended reading!